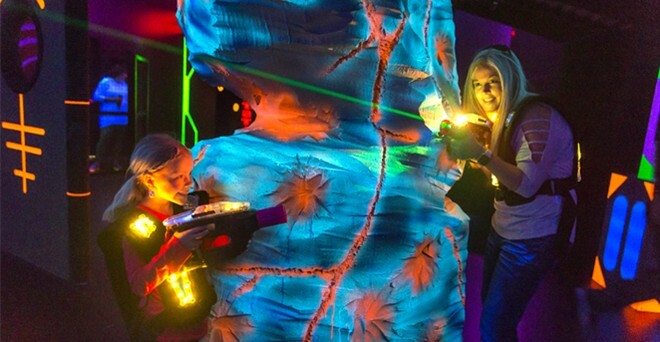 A laser tag mission is like being transported into your own life-size video game! 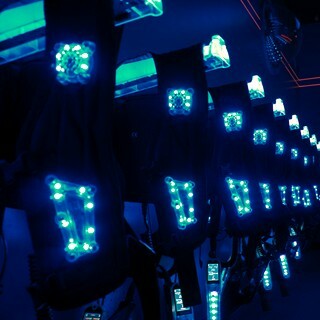 Equipped with high tech laser tag vests participants compete for the highest individual and team score. Points are scored by tagging opposing players, bases, and interacting with all the special devices in the arena to maximize your scoring potential. Imagine being equipped with a high-tech phaser and vest, entering into a futuristic outpost somewhere in the galaxy. Haze fills the air, faintly you hear mission control issuing commands over soft celestial sounds. Then suddenly a loud broadcast "Get ready ..." and pulsating music fills the arena, your phaser and vest activate and with a final broadcast "Get ready ... GO!" You are immersed in the most high-tech game on the planet! 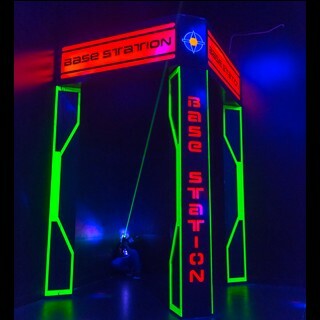 Laser tag missions typically run every 20 mins. Each game is 12 mins. long but the whole experience takes about 20 minutes including the mission briefing and time to suit up for you mission. 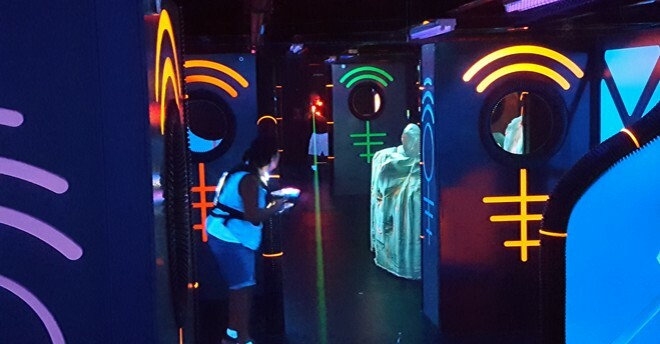 One of the only 4 base arenas in the country, this arena design provides for one of the most intense laser tag games formats available; 4 TeamPro. Four teams battle for the top score while protecting their base. 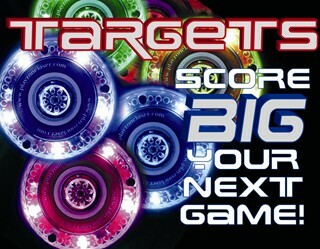 This game format is played during All-You-Can-Play sessions. 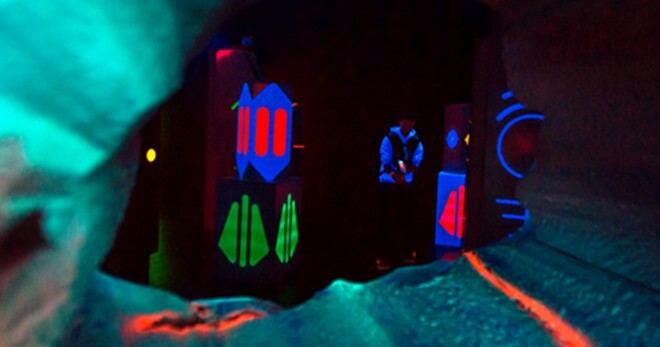 Our multi-level arena are designed for maximum playability with two levels of play, play between levels, 4 equal entry points to the top level, equal access to all bases, and no deadends. 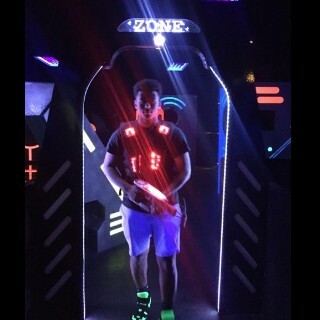 Tag the zone gate to capture it. 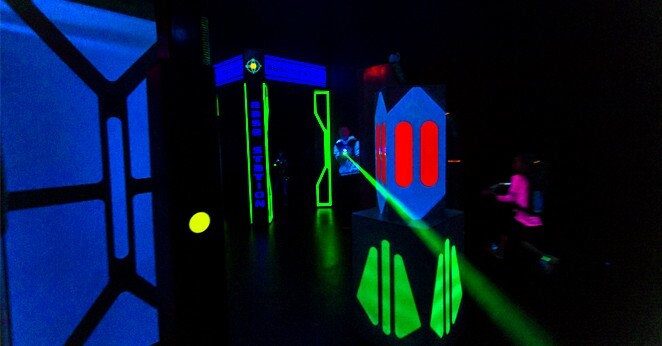 While captured, opposing team players can not pass throught the gate without being deactivated. The zone gates add another dimension to the battle for control over the top level of the arena. 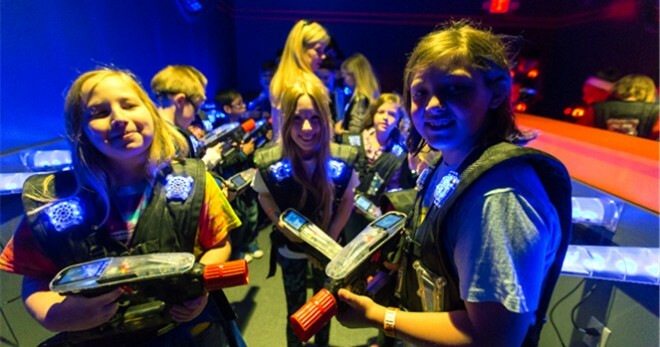 Our interactive scoreboard gives real time details of your laser tag mission. Projected on the wall in the arcade for everyone to see, you'll definitely have an opportunity to exercise some bragging rights when reviewing your missions results. Our light weight vest with breathable mesh material and "jacket" design provide maximum player comfort. 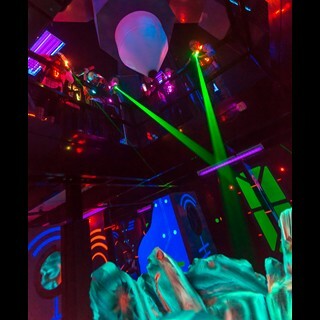 The brillant 8 color leds provide for an immersive visual experience. 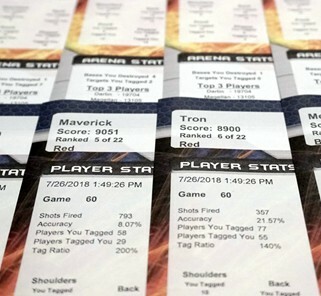 After your mission pick up your scorecards for all your detailed stats such as score, ranking, accuracy, tag ratio and all the details of who you tagged and who tagged you. 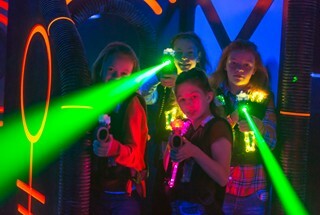 Laser Tag is a for all ages and a great group activity. 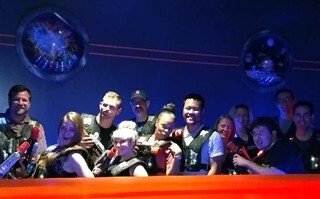 Team building, project celebrations, bachelor parties or out for a blast with some friends laser tag is a great choice. Hit the arena for some friendly competition then cool down with a cold beer and some pizza. Private missions and groups rates are available.